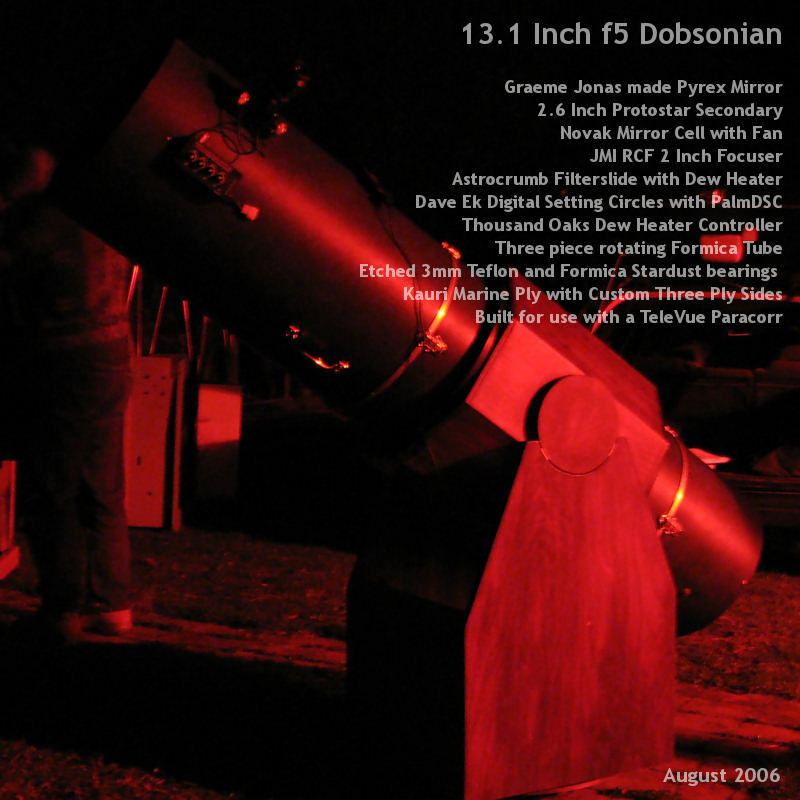 Since 2001, when my telescope was first constructed, it has undergone a couple of major refits. I had a few issues to deal with after I purchased the 80mm StellerVue AT1010 as a finder, due to its weight, that made me want to reconfigure the tube and rocker box. I purchased a new 16 inch tube and Dave Brock kindly said he would put a piece of Formica on the outside. Formica makes an excellent barrier to moisture and looks great. 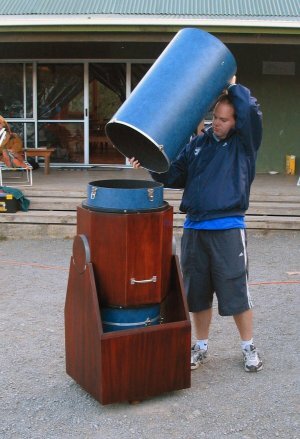 Dave Moorhouse went to the South Pacific Star Party in New South Wales, Australia, in 2003 and came back with a photo of a telescope tube that disassembled into three pieces. From the look of the scope it was practical for this tube to split into three due to the telescope being a 18 inch f5. 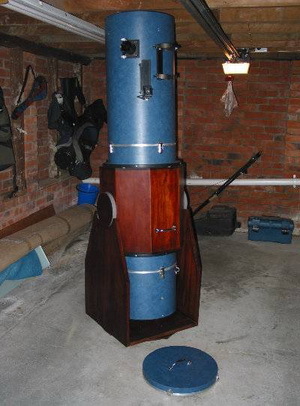 I decided to design the scope the same way to help make the telescope easier to transport and I can store the mirror section in the house where it is warm and dry, where there is no risk of mould. This process ended up being a perfect way to have the telescope due to the fact that all four pieces of the telescope weigh much the same. Ironically, the cradle sits perfectly between the top and bottom clips. The mirror section has it's own lid to protect the mirror during transportation and storage. Once the telescope was in use, it was found that the Formica had a tendency to creep slightly, that is, it would move fractionally up the tube. This is due to a manufacturing specification of the Sonotubes. The Sonotubes have an outer layer made of tar to give the tube water resistance. When the tar gets hot, the tar softens allowing the Formica to move. Subsequently we have since found out how to remove this layer, but I just have to avoid the telescope from getting warm in storage. This is fairly hard to do in summer, but as long as the scope does not get exposed to direct sunlight, this issue is not a problem. After all the scope is used in the cool of the night normally anyway. Assembling the scope takes approximately eight minutes. 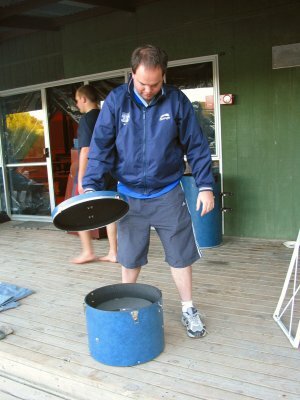 First, the mirror section is placed on a flat surface and the mirror lid is removed, exposing the surface of the mirror. Caution in now required to ensure that the mirror is not damaged by the cradle section being clipped to the mirror section. Once the mirror is ready, the cradle section is lifted and placed onto the top of the mirror section. There are four clips and each clip must be clipped up to ensure a secure connection. The cradle section rotates on the tube. The tube is Formica and the bearings are Teflon allowing the tube to rotate easily but not freely. The black bands keep the cradle attached to tubes at all times. 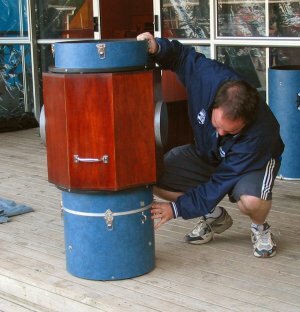 When the telescope is in use there is a 3mm gap between the bottom ring and the cradle, meaning that the cradle is rotating against the top ring. You can just detect the Teflon pad above the panel with the handle in the picture on the right. In storage the cradle sits on the bottom ring, if the cradle is not stored in the rocker. Recent work has been conducted to eliminate problems due to delaminating Formica. The rocker is special too. The rocker is a third generation development. The first rocker was too heavy and was modified to reduce weight. It had thick 1 inch sides. 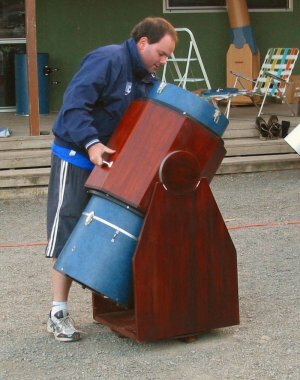 A lightweight rocker was built, and this rocker shamefully collapsed during an observing session and damaged the tube slightly. The silver tube was replaced after this accident. I have now gone back to the 1 inch sides, but each side is a triple sandwich of ply. The middle 12mm has 10 large holes routed out of it and then two 6mm ply sides are glued to the outside. The reduction in weight was about 3 Kg. The stiffness of the sides and the reduction in counterbalance weight has increased the sturdiness of the telescope back to it's original design specification. Once the rocker has been placed on a suitable surface, the mirror and cradle sections can now be place onto the rocker. By setting up close to where the mirror & cradle sections are assembled, the lifting is minimised and this is all good with someone like me who has the odd back problem. 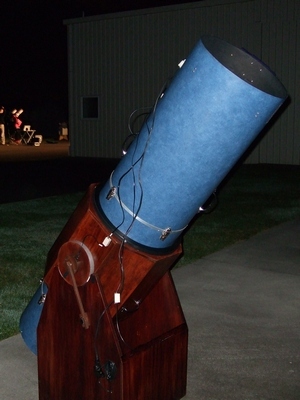 The telescope was designed to be used standing up with no bending of the back. In the photo to the left, I have the handles at waist height making picking up the scope and placing the cradle onto the rocker much more convenient and easy. The awaiting top section is in the background. The top section is the lightest only having the spider, focuser and dew heater controller on it. I used to use an 80mm Finder but now use digital setting circles. The finder was heavy and by eliminating the finder and the battery in the back of the scope, the balance is pretty close to being right, just a fraction top heavy now. Being the lightest section of the telescope, the top section is easiest to lift the tube to head height and not be concerned with over balancing or dropping the top section. This is demonstrated in the photo to the left. Once the clips are clipped securely, the telescope is basically assembled. Collimation is hardly ever an issue as the telescope clips together and is always aligned, which is really handy. However, I have now a Howie Glatter Laser Collimator, so I will be checking this after I set up each time now. Generally the whole telescope can be assembled, including DSCs and dew heaters in about 8 minutes. I always assemble the telescope alone, so as to not get someone involved who might be responsible for damage any being done. Better to do it all yourself. 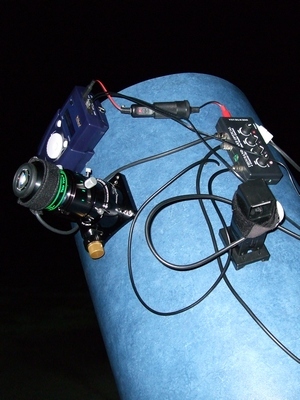 After the telescope is set up, the dew heaters are plugged in along with the fan which blows the cool night air onto the back of the mirror. Well, that’s it. All set up and ready to observe.